If the Toronto Maple Leafs’ signing of hometown star John Tavares didn’t convince you that they’re trying to win now, well…how about now? 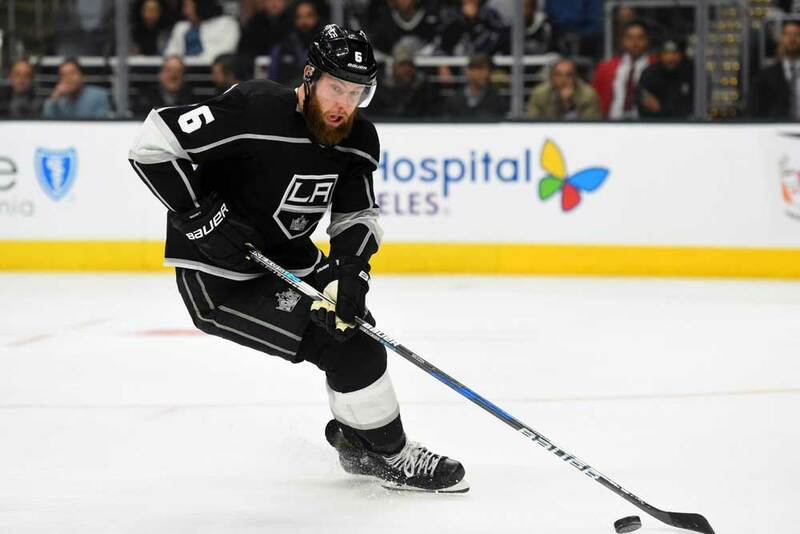 The team started the trade-deadline arms race one month early by sending a first-round pick as well as prospects Carl Grundstrom and Sean Durzi to Los Angeles for veteran blueliner Jake Muzzin on Monday night. Only three years after picking Auston Matthews first overall in the draft, the franchise has entered championship-or-bust territory and thus decided to sacrifice futures for an immediate shot at the Stanley Cup. The team’s declaration of intent won’t strike fear in opponents until the Leafs prove they can advance past the Eastern Conference quarterfinals — which hasn’t happened since 2003-04 — but it certainly sends a powerful message to the locker room. That type of buy-in from management should inspire its troops and convince them that championship glory lies within reach. While Muzzin (21 points in 50 games) may not push Toronto over the hump by himself, he vastly improves its back end. However, let’s be clear here: He won’t turn these Leafs into a squad capable of suffocating opponents. The 29-year-old isn’t a pure shutdown defender and hasn’t been tasked with that responsibility over the past few years in L.A. That’s Drew Doughty’s job. As such, Muzzin’s ability to handle top competition is a question mark. 2014-15 was the last time he assumed that role…and it didn’t go well. Doughty, who always faces the opposition’s best, enjoyed significantly better results once Muzzin was moved to the second pairing (45.8 GF% vs. 64.8 GF%). Their possession numbers together were superb (58.5 CF%, 54.6 SCF%), but he committed more mistakes than you’d like from a first-pairing blueliner on a stingy team. Context is crucial, though. The Leafs aren’t a defense-oriented group. No single player was ever going to remedy their woes on the blue line because they seem rooted in tactics rather than personnel. Embracing and perhaps refining their current high-flying identity is thus a smart move. Until recently, the Kings were a possession powerhouse that attacked with volume, yet Muzzin still managed to consistently outperform his teammates in shot and scoring chance shares. Even this season, with L.A. controlling 48.1% of the bids at 5-on-5, he’s managed to break even. Above all else, he’s simply trigger-happy. Since 2016-17, he ranks 17th in shot attempts and 20th in rebounds created by defensemen. He is constantly willing and ready to try his luck — whether his looks come from the point or a decision to push the envelope and join the attack. That everything-goes mentality should pay off handsomely in Toronto, where the Leafs are occasionally guilty of passing up shots and hanging on to the puck for too long. With Muzzin’s direct approach, they should strike a better balance on offense. They can now manufacture highlight-reel plays in space or roll up their sleeves and overload the dirty areas in hopes of finding a greasy goal. That versatility will only grow in importance as the games get tighter and coaches lean more heavily on their game plans. Beyond his own contributions, Muzzin’s arrival pushes Ron Hainsey down the lineup. The 37-year-old’s effort can’t be faulted, but he isn’t cut out for life on the top pairing anymore. His decision-making has slowed to a crawl and he struggles to keep pace with the speedsters around the league. As such, he’s acted as an albatross next to Norris Trophy candidate Morgan Rielly (50 points in 49 games). The with/without numbers are staggering: 48.8 CF% vs. 54.3 CF%, 49.7 SCF% vs. 56.7 SCF%, 58.2 GF% vs. 69.4 GF%. Lightening Rielly’s burden and freeing him up to dictate the pace is a huge development. Though Muzzin isn’t a right-handed shot — which will force someone to their opposite side — he’s faster and stronger than Hainsey. More importantly, he’s much more effective with the puck. While heavy forechecking still gets the best of him at times, he can make a crisp first pass and facilitate Toronto’s transition game. That may not seem life-changing, but the Leafs’ star forwards have often been left scratching their heads as Hainsey and Nikita Zaitsev pass pucks to no one in particular. Without the constant stream of turnovers and icings (3rd in the NHL in icings), the likes of Matthews, Mitchell Marner, John Tavares, William Nylander and Nazem Kadri will be granted more chances to impact the game. Muzzin also brings value as an integral member of the Kings’ 2014 title-winning squad. He played a major role in their success is now set up for a similar run as a 1B option who can help the team in several areas. That particular Stanley Cup postseason was a wild ride, as L.A. faced three Game 7 scenarios and prevailed each time. Such experience in high-leverage moments is a priceless resource for Toronto’s young stars. Merely losing doesn’t constitute learning how to win. Adding Muzzin to a veteran group featuring Hainsey and even Patrick Marleau — despite a glaring entry on his resume — should offer a calming influence to a team that sometimes veers off the rails in the face of adversity. Maintaining focus is key to digging deep when it really counts. Furthermore, Muzzin is on a friendly contract ($4M cap hit) that expires at the end of next season. If this partnership doesn’t pan out for whatever reason, it isn’t some David Clarkson-style calamity. Both parties can quickly and painlessly move on with their lives. For now, it’s worth noting that general manager Kyle Dubas completed this deal well before the trade deadline. As a result, Muzzin should have ample time to get familiar with his new teammates and system. Toronto plays at quicker pace and with less structure than the Kings, so an adjustment period is expected, but working through it one month early should allow the revamped Leafs to find their stride at the right moment. Though the acquisition of Muzzin doesn’t necessarily address the club’s biggest issue, he definitely shores up some of its remaining weaknesses. He’s a tremendous complementary piece who can bolster the top pairing and provide an alternative angle to the Leafs’ usual offensive tack. With his barrage of shots and solid breakout passes, he isn’t there to batten down the hatches. He’s there to sharpen the tip of the spear.